with ease in space conscious locations. An ideal fit for parking enforcement agencies, police departments, event patrol, university campuses, security patrol, water meter reading, airports, golf courses, zoo’s and more. 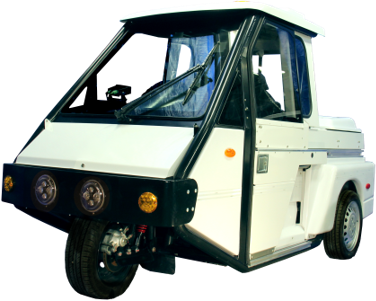 The GO-4 has been operated as a parking enforcement vehicle for cities like Seattle and San Francisco since the early 1990′s. The NYPD utilizes the GO-4 vehicle to increase police presence through out the city. Municipalities from coast to coast haven chosen GO-4 for its overall nimble size. At only 54 inches wide it requires much less room in a street lane. In dense locations it can navigate traffic much quicker than traditional vehicles. Extremely efficient with a 66 horsepower 1.0L engine, averaging up to 45 MPG. It is slender yet robust in design, built for safety and dependability. A work horse of many parking agencies. Please see our design focus section for illustrations.